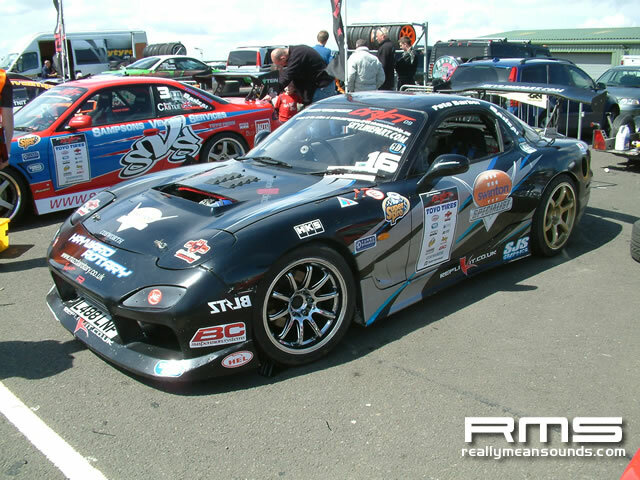 Thanks to Europeandriftchampionship.eu: A rotary-powered roar reverberated around the slopes of Knockhill as Pete Barber and his RX-7 stormed to victory in Round Two of the Need For Speed European Drift Championship, moving him to second in the competition overall. 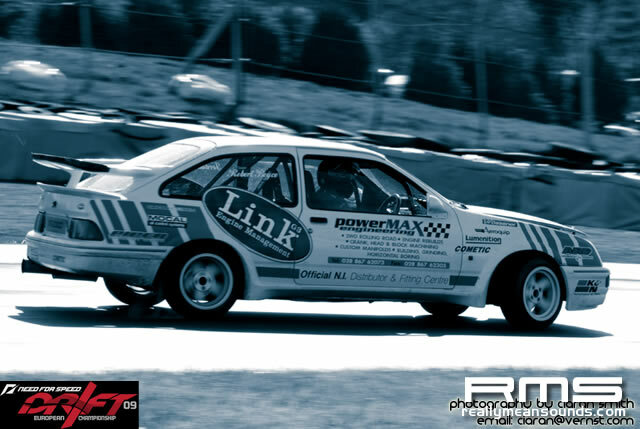 With twenty one cars turning up to the Scottish event, including five drivers aiming to attain their EDC license during the practice sessions, it was set to be a competitive field. Throw into that plethora of talent a blind first corner that drivers would aim to launch into at over 90mph before descending into the steep course, and the crowds of drift fans were in for a treat. Early practice sessions added an extra element of difficulty too, the circuit still holding some dampness from rain overnight. 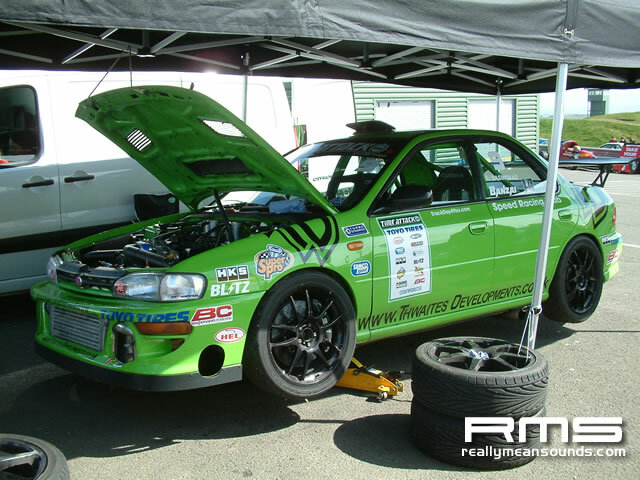 For those first-time EDC drivers this additional slip factor was proving a real challenge and by the end of the session only two of the five drivers were granted a way through; Rennie Morrocco in the E36 BMW and Richard Bradley in the Bradley Motorworks S14. 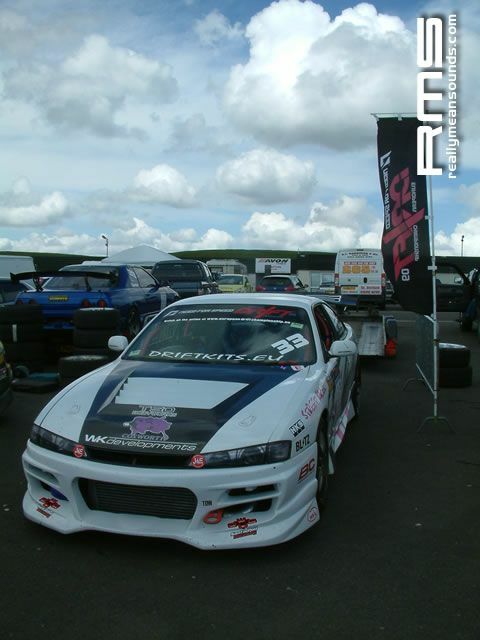 Kev Hughes in the purple S13, Lewis Gelldart in the yellow S14 and Robert Boyce in the Sierra Cosworth all showed great improvements throughout the session, but with safety a primary consideration when it comes to twin drifting it was judged that they weren’t quite ready. 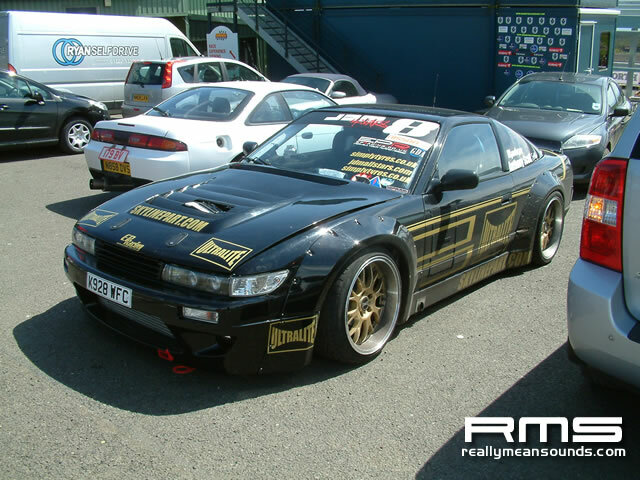 Morrocco wasn’t safe yet though, the lucky dip nature of the way the ties are organised meaning he would have to face Alan McCord, while David Monaghan in the gold R32 Skyline would also have to compete against Brett Castle to progress to the final sixteen. Experience showed through in these two early encounters though, with McCord and Castle both progressing. The lucky dip draw also made for some interesting battles in the final sixteen, with four of the hotly-tipped drivers drawn against each other in these initial rounds. 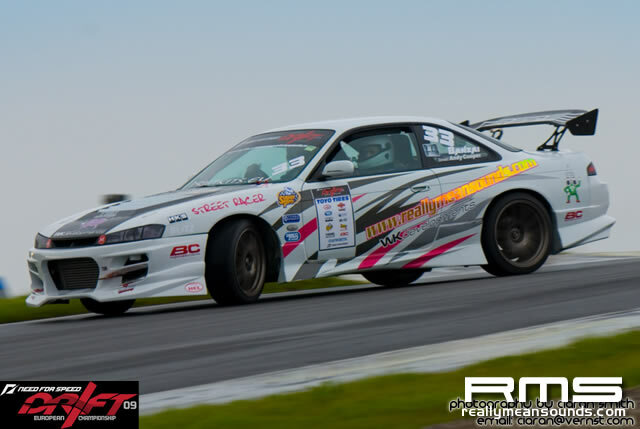 Declan Hicks in the Toyota Soarer faced current championship leader Phil Morrison in the Driftworks S15, while there was also a Northen Irish bface-off between Mark Luney in the turbocharged SVA 350Z and Paul Conlan in the 2JZ-powered S15. For many fans, these two pairings would normally have made perfect semi-finals, but destiny would hold that two of these drivers would be going out after just one battle. Hicks and Morrison proved to be almost inseparable in their two runs with the judges just giving the advantage to Morrison for his speed at the top end of the course. The Northern Irish battle was even closer, the drivers equal after two runs so having to do it one more time. Conlan had admitted to struggling to get to grips with the first corner during practice, but still made Luney work hard all through the course for a win that enthralled the crowds. There were a few spins in the other battles that made progression to the last eight easier for those who stayed on track. With the steep downhill course it was a fine line between success and failure, the smallest amount of unnecessary throttle or lock enough to spit even the most experienced driver into the gravel. 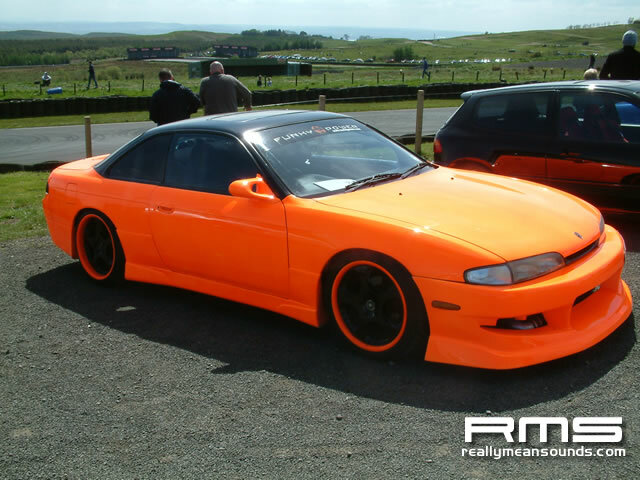 McCord was one such victim in his battle with Ian Harrison in the borrowed S13 of Kev Hughes (his R32 Skyline developing engine problems during practice). Perhaps it was the addition of new electronic power steering that upset McCord’s run, but a slide backwards into the gravel on the outside of the last bend spelt the end of his day. 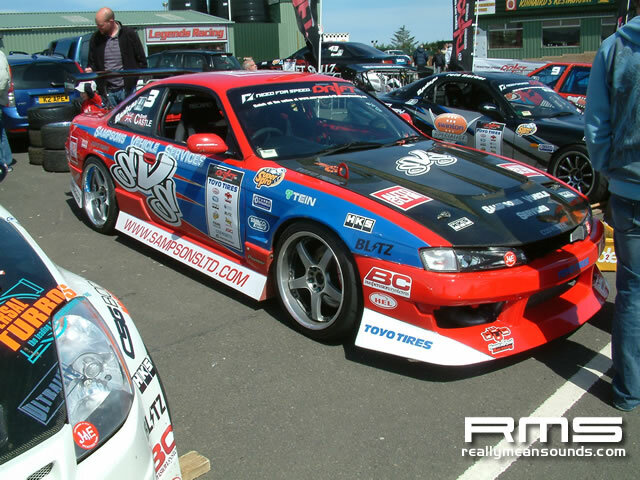 The other V8-powered S15 of Paul Cheshire came off at the second corner while chasing Andrew Cooper’s Nissan, ripping off his front bumper in the process and helping Cooper progress, while Robin Neeson’s Chaser came off at the same place but in even more spectacular style against James Russell in the DCY R32 Skyline. Scottish driver David Waterworth flew the St Andrew’s Cross proudly from the back of his orange S13 in his dual with Castle, but a mistake saw him take gravel on board and let the 2007 EDC Champion through, while Keiran Cameron’s S13 faired slightly better, beating the black Skyline of Gary Hughes. 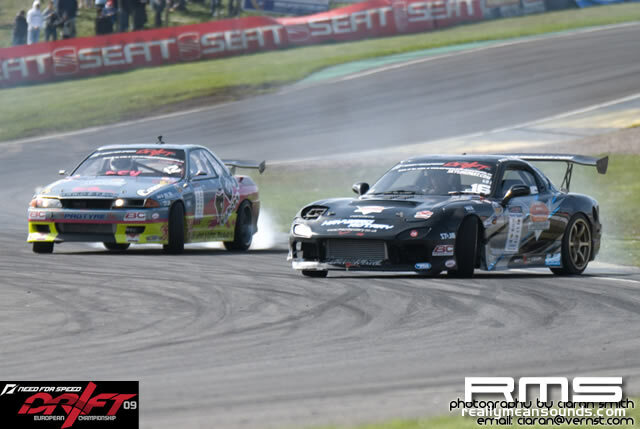 The final pairing in the last sixteen matched the newcomer Bradley against Barber in the RX-7, and it proved to be one of the closest ties of the round. 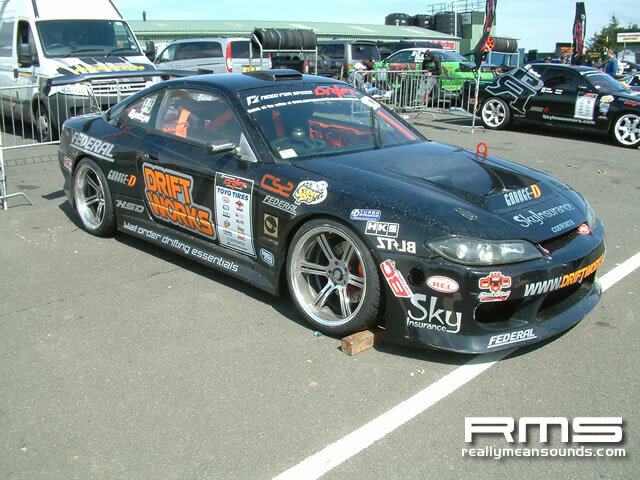 Barber looked determined at Knockhill, with the RX-7 getting great angles and speed through every corner, so for Bradley to push for one more run was quite an achievement. In the end it was the aggressive chasing of Barber that separated the two, but Bradley’s performance suggests he’s one to watch in the future. In the last eight then it was Harrison versus Morrison, Russell versus Cooper, Luney against Cameron and Barber taking on Castle. As the finals got underway, the Knockhill visitors turned out in force to watch the high speed skill of Europe’s finest and they weren’t disappointed. Morrison and Harrison showed how close things could get, Harrison doing particularly well considering he was driving a borrowed car for the finals. 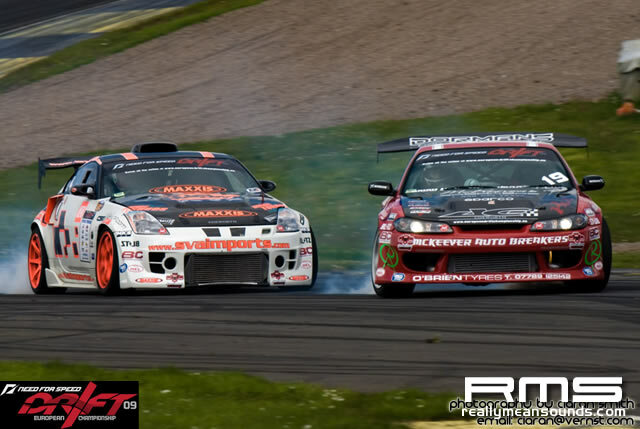 Again it was Morrison’s speed that just edged him ahead though, which guaranteed the onlookers more heavy tyre smoking action in the semi finals from the monster S15. Cooper was unfortunate in his clinch with Russell, a foray into the gravel making it a relatively straight forward route to the semis for the sideways loving Skyline of Russell, while Cameron lost his rear bumper again during his second run against Luney thanks to a slip at the second bend. That small error was enough to separate the two and send Luney through. In the final match-up all eyes were on Castle to see if he could finally beat Knockhill, a circuit that has become a bit of a bogey for him, but by the end of the session all eyes were on Barber. The pair ran each other close, completing four runs in total, but the judges pointing to some slight hesitation from Castle in the third as the only difference compared to Barber’s flawless effort. Heading into the semi finals and Morrison looked on track to reach another final, hitting his first run against Russell with a much bigger entry. But it came unstuck for Morrison in the second where his speed chasing Russell cost him dear. 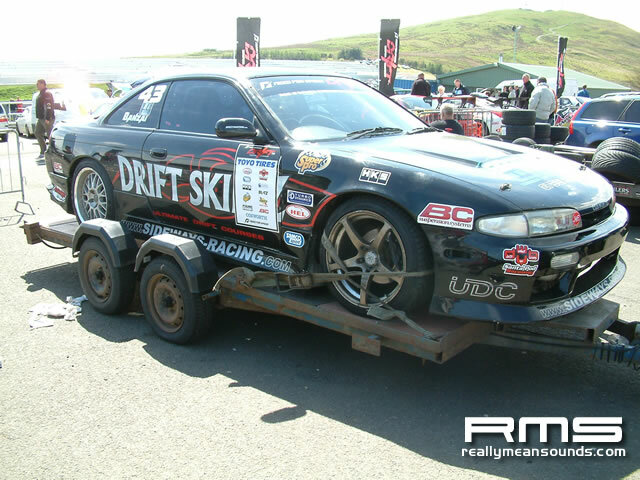 The Skyline was the slower car into the bottom section which forced Morrison to adjust his angle to avoid contact. The resulting loss of speed and straightening up meant it was Russell heading into the final battle. 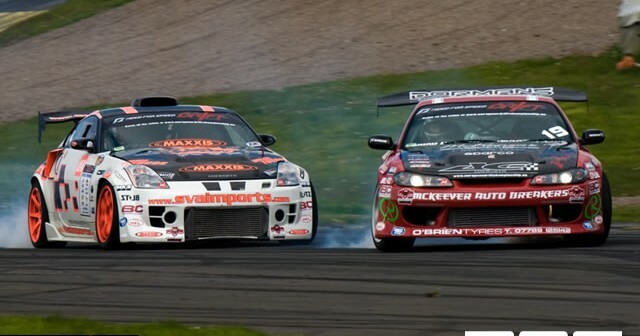 In the other semi final Barber continued to look hungry for victory, a shadow to Luney’s 350Z on the first run to force Luney into an aggressive chasing run. Like the other semi final, the chasing cars speed proved to be its downfall as Luney, like Morrison before him, had to adjust his angles dramatically to scrub off speed and avoid a shunt. Coupled with Barber’s slight advantage from the first run, Luney would now have only a battle with Morrison for third place to look forward to. Luney went on to win that contest, the pair proving equal through the first two runs but a rare and dramatic spin from Morrison exiting the first corner ending up being the difference. It was the final people were here to see though, with two seemingly unlikely drivers contesting it; James Russell and Pete Barber. 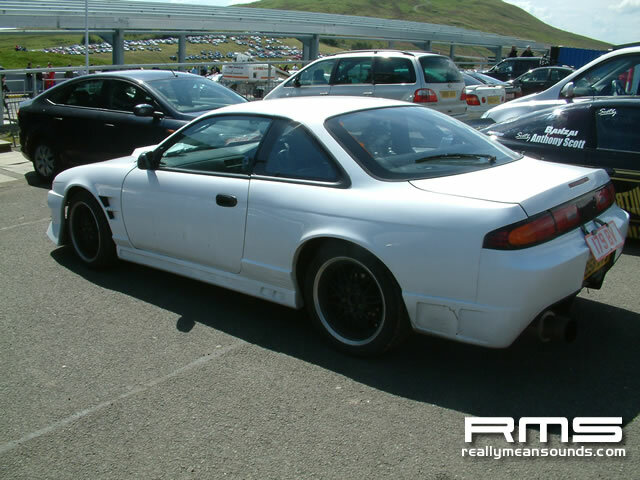 Both had proved throughout the day their ability and a Skyline versus RX-7 final was certainly an unusual treat for the crowds. As the cars appeared over the brow of the hill for the final it was the light blue GTR of Russell taking the lead, putting down plenty of speed and big angles. But Barber was like a limpet on him, following his every move and almost hiding the diminutive Mazda behind the bulkier Nissan with his right foot seemingly buried to the flooe. The judges gave Barber the narrow win on that run, which proved to be enough to hand him first place at Knockhill after a tied second run. A delighted Barber said afterwards; “My sponsors, Swinton, Haywood Rotary and Network Blinds keep telling we need a win so here it is. 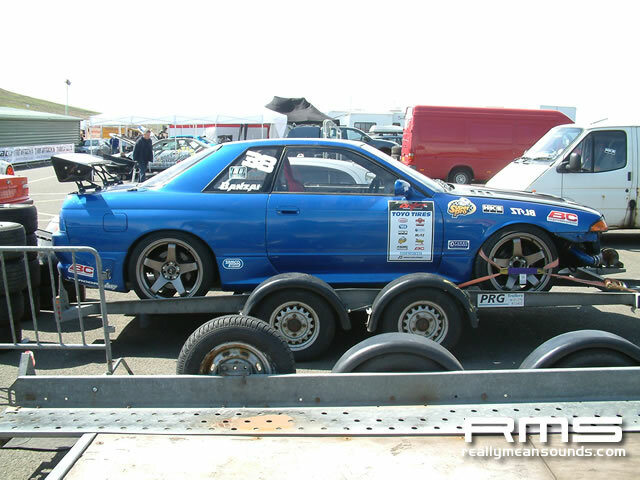 After last year we had a lot of problems and people kept telling me to get rid of the rotary engine, but the new 13b we have now proves otherwise”. A similarly jubilant Russell also felt he’d proven a point with his performance,; “Myself and Distinctive Cars of York Europe have put a lot of work and improvements into this car. I think I’ve surprised a couple of people, they’re used to seeing me just above midfield, but they’ll have to get used to me being right above that now!”. Morrison may still be at the top of the Championship table, but there are plenty of incredible drivers snapping at his heels now and no doubt believing they can usurp him by the time Round Three at Silverstone is over.